When the Giants lost their first two games of the year, we all conjured up memories of last year’s 0-6 start and thought “here we go again.” When they recovered to win the next three, and in fairly convincing fashion, we thought “well, hold on now, we might have a winning team on our hands now!” Over the last two weeks, those positive feelings have all but disappeared, as the G-Men got shut out by the Eagles in Week 6, and then smacked around in Dallas in Week 7. I’m here to talk about that Dallas game, so let’s just get it over with. I could sit here and tell you all about how the defense allowed 31 points to Tony Romo and his boys; how they couldn’t stop DeMarco Murray at all; or maybe even about the two backbreaking turnovers by Larry Donnell. Instead, I’m going to focus on some of the golden positives that we saw throughout the game. How about Odell Beckham Jr.? He didn’t get his hands on the ball too many times, making just four catches on the day, but he made those count, as two of those grabs were for TDs. He also looked good returning punts, and even ran for 13 yards. The rookie finally got on the field a few weeks ago, and he’s really showing the Giants that he’s going to be some kind of special player. With Victor Cruz suffering that devastating knee injury in Week 6, the Giants are going to need Beckham to step it up. Also, Rueben Randle had 6 catches on the day, bringing his team leading total to 34. Hey, at least we all still feel pretty great about letting Hakeem Nicks go, am I right? That guy stinks. Beckham catches one of his two TDs. Let’s add Eli to that list of positives, as he went 21-33 for 248 yards and 3 TDs (Daniel Fells caught the one that didn’t go to Beckham). You can’t really blame Eli for this loss. The Offensive Line was terrible again, forcing Eli to throw the ball away all night long. Eli has really turned things around for himself this year. After throwing for only 3 TDs and 4 INTs in the first two weeks, Eli has rebounded to throw for 11 scores with just 1 pick in the last five games, and that interception should have been a Rueben Randle TD (I’m still mad about that!). The last two losses have had everything to do with the Offensive Line not doing its job, and nothing to do with Eli. He’s been terrific. I’m going to throw a bone to Jason Pierre-Paul for his performance in this game too. This defense allowed a lot of points, but JPP had a great game, registering 6 tackles (3 for a loss), 2 sacks and 3 hits or hurries on Romo. Did I mention that he was working against Tyron Smith, one of the best OL in the league, the entire night? Pierre-Paul and Johnathan Hankins were seemingly the only two guys on either line to show up to work in Week 7. Congratulations, fellows. 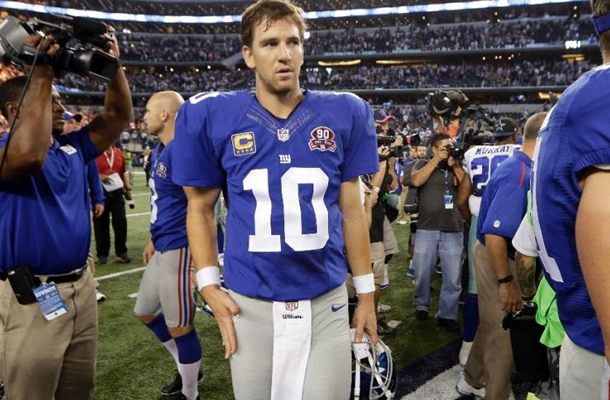 To sum this game up… Yes, the Giants lost another crucial division game. Yes, they fell very far behind both the Eagles and Cowboys. Yes, the playoff hopes are probably dashed right now (not completely though!). But, as fans, it’s important for us to look at the positives. The Giants have a lot of key pieces in place that could, some day fairly soon, lead them back to the promised land. Eli has improved and is back to his Super Bowl form, and Beckham is an absolute star in the making. Even Prince Amukamara has finally come into his own in a fairly strong defensive secondary. The truth is, this team could still make the playoffs as the second Wild Card. It won’t be easy, as there are a few teams ahead of them (one of them the Packers), but it could happen. I just hope they make it through the rest of this season healthy, and continue to add pieces that could make them contenders next season. They’re not quite there yet, but they aren’t far. If you want to see the numbers, get your boxscore here, courtesy of Yahoo! Sports.